We have been selling Hulda Clark zappers since 1997. We're very proud of it. We believe in the zapper. We believe in the benefits to our family's lifestyle and to the world at large. It feels good to know that by selling zappers, we are making a living helping other people and our future generations. If you are like us, who have achieved amazing results from the Hulda Clark zapper, you might be the perfect person for this unique opportunity for health and wealth. Improve your health with the Hulda Clark zapper and help other people as well. Health care practitioners benefit from purchasing several units and loaning them out or selling to patients. If you use a zapper and have a story of how it has helped you, share your enthusiasm with your friends, family, church group, and community. Person 1 begins the rotation with a 7-minute zap, then takes a 21-minute break while 3 people takes turns zapping for 7 minutes each. After 3 people have zapped for 7 minutes each, Person 1 begins another round. Repeat until each person has zapped three times for 7 minutes with 21-minute breaks in between. Share stories or watch videos about Hulda Clark and the Hulda Clark Zapper while you zap together. The Media & Resources page at HuldaClark.com has links to materials that inform and inspire. 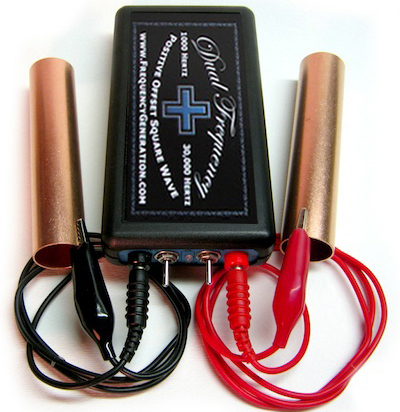 Better yet, have some Hulda Clark Zappers on hand to sell during your zapping gatherings. Keep some in your vehicle in case you meet someone who would be interested in purchasing a zapper. It only takes a minimum of 3 units to receive a substantial distributor's discount off the price of the Hulda Clark Zapper. Ships free within the United States and comes with lifetime repair/replacement warranty. You could keep 1 for yourself and resell the other 2 to begin this journey to better health and greater wealth. Together we can make a healthier world, one community at a time. In all of Dr. Hulda Clark's books, she published only two zapper circuits. The original 30 kHz zapper with copper handles, and the low frequency 1 kHz zapper used to power a Food Zappicator or Toothbrush Zappicator. Frequency Generation brand Hulda Clark Zappers now offers a Dual Frequency Zapper for those who want the benefit of both frequencies in one unit. As you read Dr. Clark's books, and want to experiment further, the Dual Frequency Zapper will allow you to add accessories easily. For more photos and information, please visit the web sites below. How to Zap from Frequency Generation on Vimeo.